I find it uncontroversial to say that umami is the backbone of food generally. Western cooks, as a matter of policy, tend to nod politely whenever it’s mentioned. They seem to have no deep appreciation of the concept. After all, in the US, we’re told simply that umami is some sort of weird, fifth, “meaty” taste and we’re happy to leave it there. Western cuisines taste plenty good as they are, so none are the wiser. But, as it turns out, there is something to be learned from Eastern approaches to umami and cooking generally. Part of the reason umami is so confusing to Western tongues and minds is that it’s not as intuitive a taste as the more familiar sweet, salty, sour and bitter. The reason we even call it a “taste” has more to do with the scientific definition of “taste” rather than the subjective experience of it. We have receptors on our tongues that are triggered by different taste molecules and give rise to the respective sensations: Sweetness is triggered by sugar, saltiness by salt, sourness by acidity and bitterness (interestingly) by a variety of compounds that are generally toxic to us, but in some (nontoxic) cases, are quite pleasing. Umami, on the other hand, is referred to as an appetitive taste. It’s more nondescript and complex than any of the other tastes, even bitterness, and is thought to contribute to the general palatability of certain foods. Although we often hear umami described as synonymous with “meatiness” or “savoriness,” it’s actually much more than that. Early research in the West variously described umami as increasing the “amplitude,” “mouth fullness” or “bloom” of a food’s taste. More recent research suggests that these early descriptions were not necessarily far off. Umami not only provides a meaty, savory taste to foods, but also harmonizes, sustains and, yes, amplifies (up to eight times) existing tastes in a dish. Basically, umami (in just the right amount) is food magic. Given just how important umami is, it should be among the first things every cook thinks about when planning a dish. It should be, but it isn’t. If you’ve never thought through these issues, allow me to say you’re welcome. Unfortunately, umami—which is actually a naturally-occurring chemical called a free glutamate—doesn’t occur in all foods at ideally delicious levels. While some foods have a lot of umami—too much in fact—others have very little or none. 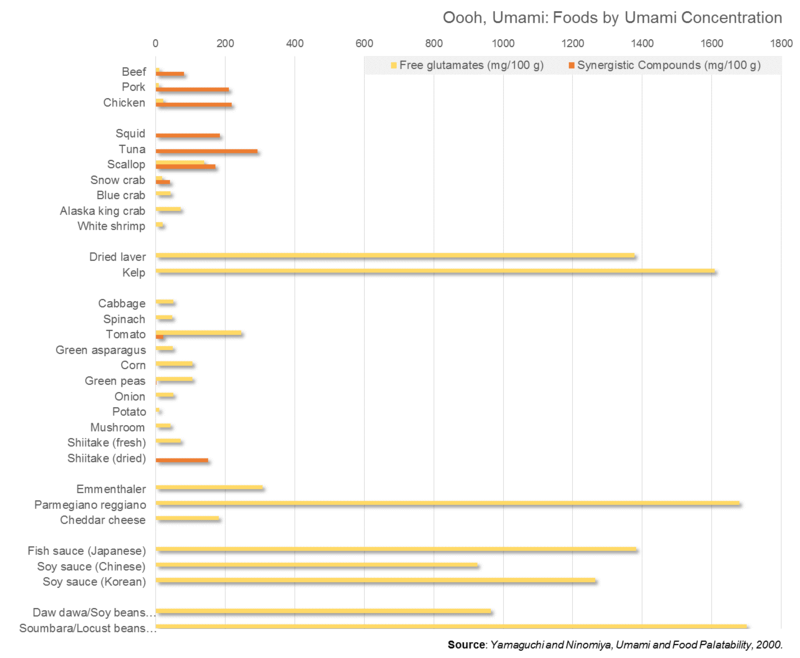 Other foods still naturally contain umami synergistic compounds (that is, natural chemicals that help to magnify the effects of free glutamates on our palettes). Although we can’t really taste the synergistic compounds alone, when combined with free glutamates, they magnify the effects of the free glutamates by some 15 times, according to recent research. Taken together, the free glutamates and the synergistic compounds can be considered umami. In the handy figure above, if you can get a dish to contain at least one food item with a high free glutamate value and a high synergistic compound value, you are immediately eating more delicious food. For example, if you combine pork (with 211 mg/100 g of synergistic compounds) with Korean soy sauce (1,264 mg/100 g of free glutamates), you immediately have a dish that is more delicious than the sum of its parts. Of course, cooking is not as simple as x plus y equals delicious. Soy sauce is salty with highly concentrated free glutamates and must artfully be combined in small quantities with pork (and other ingredients) to make a truly great dish. Despite this, if you marinade or even stir fry pork with some soy sauce versus simple kosher salt, the pork with the soy sauce is always going to taste better. By planning a dish with a bit of soy sauce (or fish sauce or parmegiano reggiano cheese or tomato) your food is immediately elevated beyond the sum of its parts. Unfortunately for us all, there is no ideal level of umami in a dish that will make for ideal deliciousness. This is also not merely a matter of taste or a difference of opinion. It turns out that as you increase the amount of umami in a dish, the more savory elements begin to overwhelm the tastes and flavors of your other ingredients, substantially obscuring nuances. The level of umami that begins to obscure rather than highlight tastes and flavors differs from dish to dish, based on the ingredients you’re working with. Fresher, assertively flavored herbs such as cilantro or basil and vegetables like jalapeno peppers or green onion, for example, tend to have a greater ability to absorb umami and retain their nuance. However, more savory ingredients such as meats or mushrooms, or delicately flavored ingredients such as Italian parsley or ginger, tend to have their more nuanced flavors quickly overwhelmed by excessive umami. Eventually, you can even obscure the taste of, say, acid in a dish with too much savory umami. I like to call this the “umami load” of a dish, or the amount of umami a dish can bear before the tastes and flavors start to be obscured. There is also no way to master the use of umami without practice, developing what I call a “taste toolkit,” or the experience-honed sense of what a dish needs to improve its overall taste balance across all tastes: Sweet, sour, salty, bitter and umami. In my view, there is not a lot I can tell you or explain to you that will allow you to understand this. Here, doing is knowing. For example, one thing to keep in mind in principle is the ideal ratio of the umami components (that is, the ratio of free glutamates to synergistic compounds). Ideally, they should be about fifty-fifty for maximizing the perceived umami taste. Thus, in addition to keeping in mind the salt content of soy sauce (or other umami-laden ingredient), you have to be aware of the ratio of umami components when pairing that soy sauce with pork, in our example. This is easier said than done because, if we stir fried the two together, soy sauce would not be combined perfectly such that every bite would contain the ideal fifty-fifty ratio of umami components. Obviously, the pork would absorb only some soy sauce during cooking but much of the soy sauce would remain in sauce form. When we eat the pork, as we dipped it in the sauce, our goal might be to obtain the ideal balance in each bite, but what amount of free glutamates in the sauce do we need to achieve this? Although in principle this is a scientific question, in practice it’s far from it. What should be clear now is that you have to taste a thing to understand it, developing and relying upon your taste toolkit. In my articles and recipes to follow, I’ll develop this idea more directly. In the meantime, my suggestion is to notice what happens in a dish when you mix and match umami components and umami generally with other ingredients. A great starting point in exploring umami is using umami rich dashi in your cooking and understanding how umami interacts with other tastes. For your convenience, I’ve created a handy guide to dashi, along with a recipe for a Japanese vegetarian soup which prominently features dashi, called unpenjiru, and three recipes for Vietnamese-inspired soups, each of which heavily draw on umami. I’ve also created a guide to hot sauce which makes good use of umami, as well. The key to extraordinary deliciousness is, as it turns out, right in front of you. It just takes a bit of work.